When using the Cascading Copy feature, it may be useful to control the execution of “second run” jobs independently, e.g. to let “second run” slower destinations copies be executed in parallel to “first run” offload jobs. 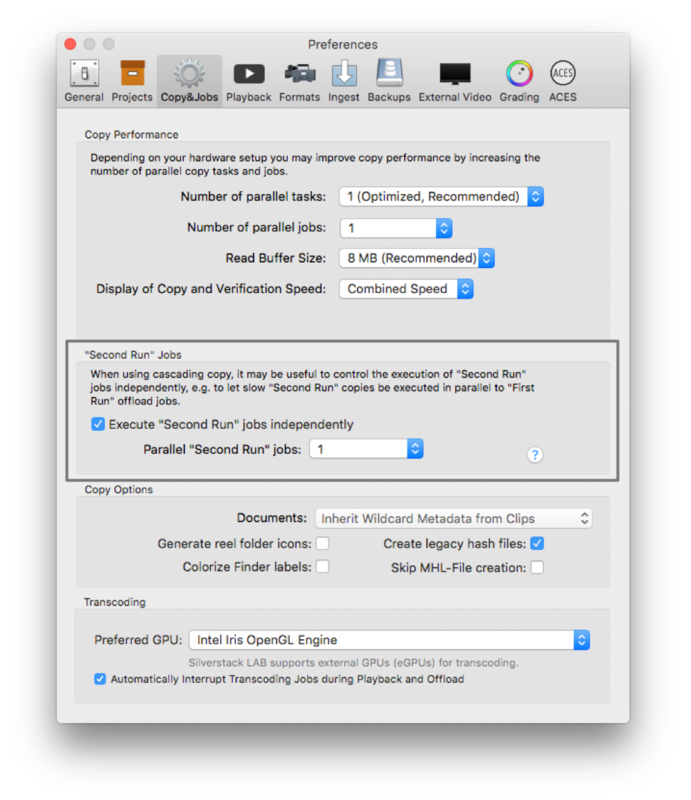 This settings can improve the copy speed when high performance hardware like RAID disks, as these devices can read and write data at the same time. Without the «Execute “Second Run” jobs independently» checkbox enabled, Silverstack will use the general number of parallel jobs selected in the «Copy Performance» section. In this case, without the checkbox enabled, it would perform the jobs sequentially, causing an offload slowdown in case you only have one magazine dock available, as you would have to wait for the first camera magazine to finish its “second run” before starting the second camera magazine. From now on we assume the checkbox is enabled. The number of parallel “second run” jobs affects the overall speed at which multiple camera magazines can be offloaded using a single mounting dock. If the slower destinations can’t handle parallel writing, it’s better to set the «parallel “second run” jobs» to 1 (the default setting). In this case you are still able to offload faster from the camera magazines but the copies to the slower destinations will have to wait in line. When «parallel “second run” jobs» is set to 2 or more, slower destinations (in blue) will have to handle parallel writing, which might slow down the overall copy speed. However, if the hardware performance is good enough, this setting will give you the best speed. When the Cascading Copy feature is not used, the offloads can be made in parallel to the fast and slow destinations. The copy process is explained in detail in the article How does Silverstack’s copy process work?. How does Silverstack’s copy process work?